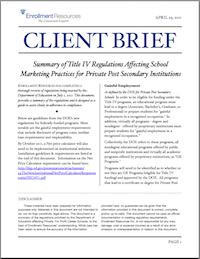 Enrollment Resources has completed a thorough review of the new regulations being enacted by the Department of Education on July 1, 2011 affecting Private, For-Profit Career Schools. We have summarized the Gainful Employment and Misrepresentation regulations into a 5-page Client Brief to assist clients with compliance to the coming regulations. Click here to download a summary PDF of this document.